The month of May sees the peak of spring neotropical bird migration as they wing through Texas from Mexico, Central and South America, and head northward to various parts of North America. Their destinations are the summer breeding grounds of far North America, and as they travel the long distances, they rest and feed in trees and rejuvenate in water features, both. 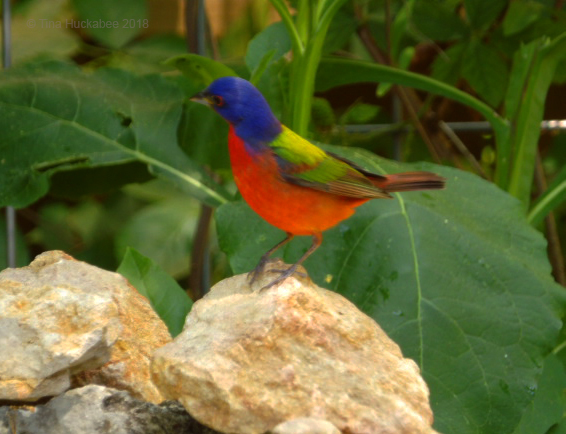 I was fortunate to observe some of the avian visitors in my back garden before I left Austin for a chunk of May, and once I returned, witnessed the tail-feather end of the songbird parade, replete with color and decorations, as they bathed briefly at the pond and flitted high in the trees. Celebrating Wildlife Wednesday, here are the migratory birds of the past month, no longer in my garden, but hopefully safely raising families in their northern, summer homes. I’m not going to pretend that this month’s WW is anything but birds. The migratory birds are gone, but not forgotten! 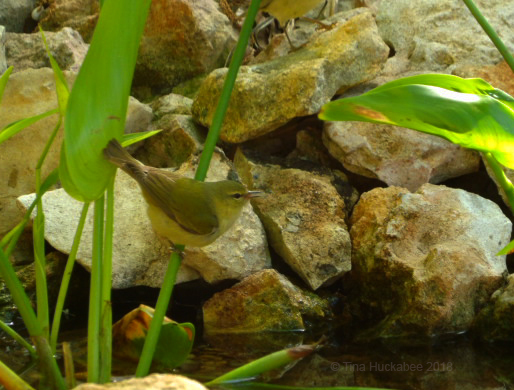 A female juvenile male American Redstart, Setophaga ruticilla, eyes the pond, ready for a cooling dip. I suspect that there were more Redstarts when I was gone, as they’ve been solid visitors, even into late May. …then chills his toesies on the the wet rocks. 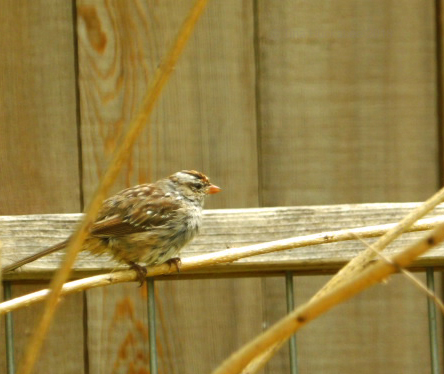 Several juvenile White-crowned Sparrows, Zonotrichia leucophrys, hung out near (you guessed it! ), the pond. Each would splash and flutter, then flit to nearby branches for drying. 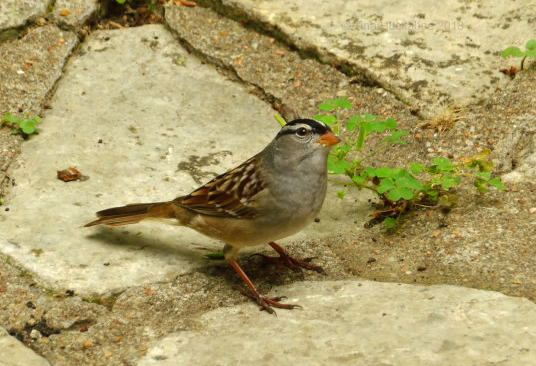 Eventually, an adult White-crowned visited my backyard bird resort, though he/she preferred pecking at seeds on the back patio. I haven’t seen this bird in my garden before (that I’m aware of), I’ve only seen photos, but recognized it immediately. 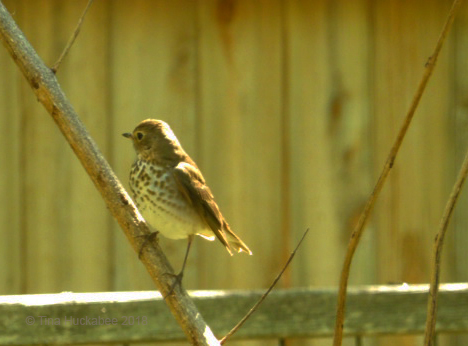 A sunny afternoon highlights the coloring of this Russet-backed Swainson’s Thrush, Catharus ustulatus. 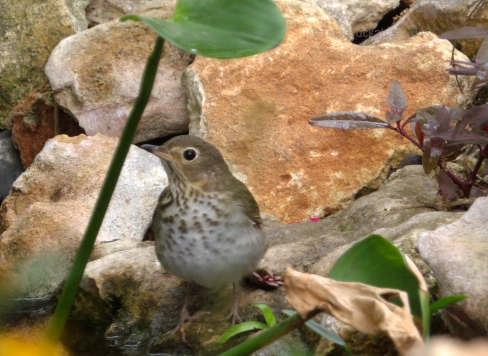 On another day and at the pond, a different bird, an Olive-backed Swainson’s Thrush contemplates a splash. The frontal coloring is more aligned with its Russet relative. I think these birds have the sweetest faces. 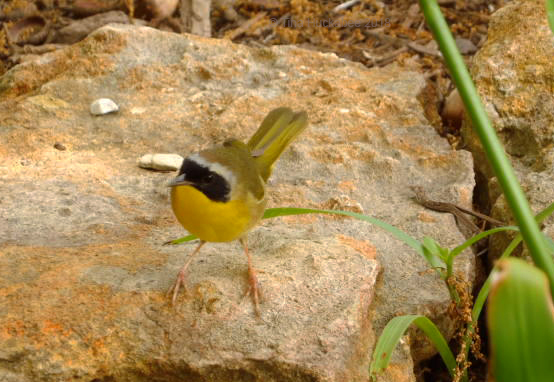 There’s nothing common to me about the Common Yellowthroat, Geothlypis trichas, like this cute male. 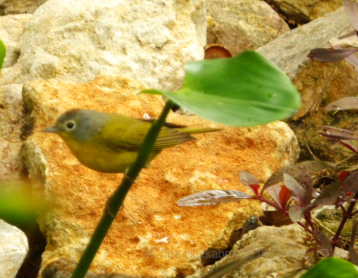 The flash of yellow darting through the garden alerts me to visits from this little warbler. Usually, I’ve the females in past migration seasons and they’re a little blander, but still darling. 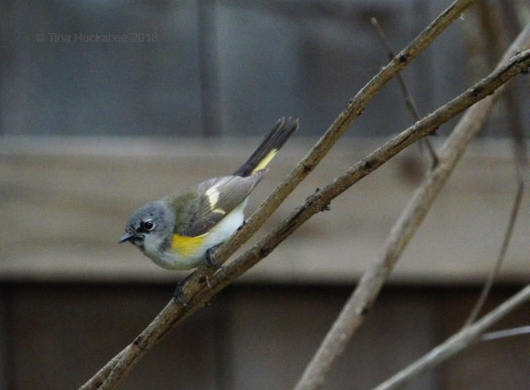 Like the Redstarts, I’ll bet there were more of the Yellowthroats in my garden while I was gone. I’m sorry I missed them this spring, but I’ll have another chance in the fall. Another new bird for me was a parade of Nashville Warblers, Oreothlypis ruficapilla. This isn’t a great shot (taken from indoors), but you can make out the reddish-brown cap, sported by males. There were quite a few of these tiny birds who found their way to my back garden. Check out the polite line-up of Nashvilles as they troop to the public bath! With their vivid fusion of blue, green, yellow, and red, male Painted Buntings seem to have flown straight out of a child’s coloring book. So begins the description of (perhaps) the most beautiful of North American birds. I was fortunate to enjoy quite a few sightings of male Painted Buntings, Passerina ciris. 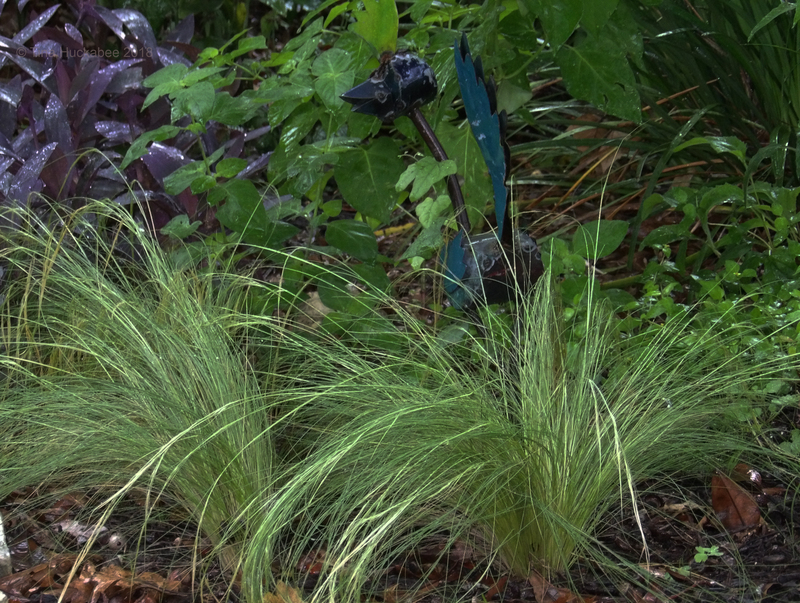 The blue, metal bird doesn’t eat the seeds of the Mexican feathergrass. … but have never witnessed a bird eating its seeds. Beauty, plus value for wildlife–that’s a garden win! 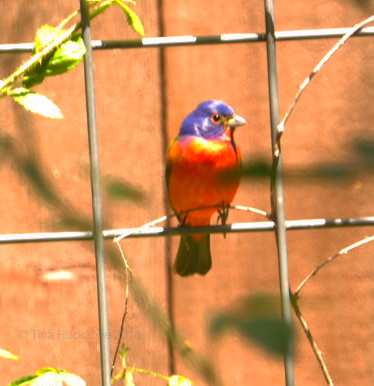 Unlike most of the birds profiled in this post who breed far north of Texas, the Painted Buntings and the Summer Tanagers, breed relatively close to Central Texas. Both visit my gardens, but only for brief periods. 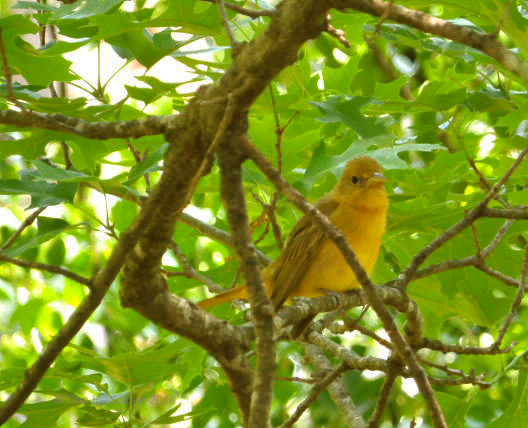 This female Summer Tanager, Piranga rubra, is an insect hunter and each late April and early May, I see them, perched above my honeybee hives, snatching bees on the wing (both the birds and the bees)! This striking, but mottled fella is a juvenile male Summer Tanager. I didn’t see the scarlet male this year. Too bad, but I was thrilled to host mom and her son–except for the bee-eating thing! 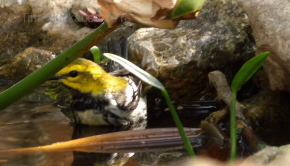 The “black-throated” part of the name is visible, but you can’t see the green sheen on the back of this Black-throated Green Warbler, Setophaga virens. It’s a bird I first saw last year and enjoyed only a brief glimpse of this spring. It migrates and breeds in eastern North America and Canada. My winter-visiting Orange-crowned Warbler, Oreothlypis celata, left some time ago, but another passed through, probably having spent the winter somewhere further south of Austin. The Orange-crowned Warblers aren’t the flashiest of warblers, but I’m charmed by their chirps and welcome their company during the winter. I was surprised at observing this one so late in the season. And those are the birds of migratory May. What wildlife happenings did you share in or observe this past month? Please post about your wild happenings and leave a link when you comment here. Happy wildlife gardening! 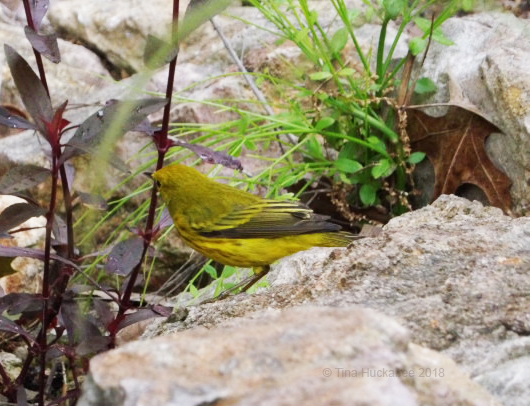 This entry was posted in Backyard Birding, Backyard Ponds, Gardening with native plants, Migratory Birds, Uncategorized, Wildlife Gardening, Wildlife Habitat, Wildlife Wednesday and tagged Wildlife Wednesday by Tina. Bookmark the permalink. What a beautiful collection of birds. You’re very lucky to have them stop in your garden. I was in the midwest for a week around Memorial Day, and saw a few birds not common in my neighborhood — particularly the indigo bunting. However, the highlight of the trip was seeing — and hearing and watching — my favorite midwestern bird. That would be the robin. More about them in my next post. 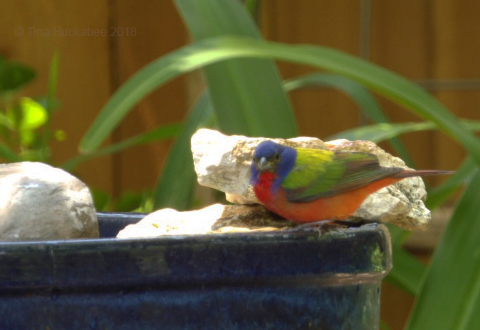 I’m so envious of your painted bunting. I’ve seen only one of those in my life (or maybe two). They are a beautiful bird, and a fine reward for all you provide for your feathered friends. I was a little worried about my few, because it’s been so hot and the bird baths were drydrydry when I got home, but fresh food and water proved in about twelve hours that the birds don’t forget! I saw my first one just 3-4 years ago. They’re interested in the pond and bird baths (duh! ), but I’ve seen them feeding on the seeds of spent S. lyrata, Lyreleaf sage and this time, on the Mexican feathergrass. Go native plants!! I think I saw a male Indigo Bunting, but it was out of the corner of my eye and I didn’t see where he landed. I didn’t know the bird that popped in on the female Painted, until I looked it up–and it was the Indigo. I know what you mean about the water going dry. I had a team of people, friends and a hired pet sitter (I have a 17 year-old dog and was concerned about him for the time we were traveling) and the pet sitter was the gardener (it didn’t really require much) except for filling the bird baths!! Thanks! Isn’t that cute? I didn’t even see the three, only one of them, until I downloaded the photo. Tina magnificent photos for some wonderful and beautiful birds. I love all the birds, they are beautiful, curious, funny and adorable. The yellow cyprus male is beautiful. 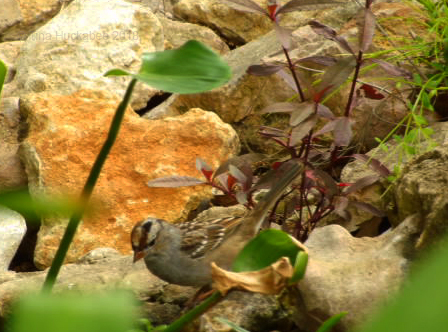 The white-crowned juvenile sparrows are very nice with which they have armed bathing and playing with water. The male common hammer is very beautiful. 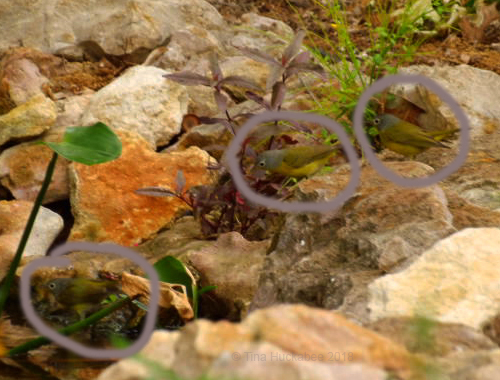 Nashville Warblers are very funny with their reddish brown cap. Painted male paintballs have fabulous colors: they are fantastic. Sumer Tanager is cute. In my garden there are many birds singing, but they hide in bushes and trees. There is a magpie that comes to the garden. There are two nests of swallows that I love to watch as the parents come and go and the chicks are seen. At sunset you see flocks of starlings flying that is a wonder. There is some crow. And verderones. Nothing else I can identify. If you want to see my new blog the address is https://margaritaexam141.wordpress.com Happy Wild Life Wednesday! Have a very good week. Greetings from Margarita. Thanks, Margarita! The birds really are lovely to watch; I feel very fortunate that they like to pop in for visits. What amazing birds, all unfamiliar to me. And fantastic photos. Thank you, Chloris. I enjoyed having the birds come by, even if it was just for a short time. Oh, what beauties, esp the colorful ones at the end. Love these little messangers. Thanks–and I agree that they are quite lovely! You captured some amazing shots of your migrating visitors! That’s one of my favorite spring “things”–watching for the migrating birds as they come through. This year I missed a lot of them because I was gone in early May. I saw quite a few grosbeaks, but only one oriole–and I usually see quite a few. But the oranges were pecked, so they were probably here when I was gone. 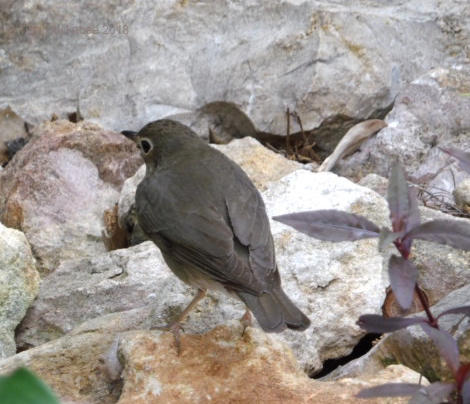 We did have some hermit thrushes come through in April, which I don’t remember seeing before. Fun stuff! Again, great photos! I’ve only seen male grosbeaks once or twice, but I saw a group of 4 females in April, for a minute, and then they were off! And no orioles for me this spring. Maybe in autumn. I agree–fun stuff! Wonderful display of the visiting birds. I am envious of your pond. Did you guys build it yourselves? Thank you! Yes, we built it about 9 years ago and my only regret is that I didn’t build one sooner! Wow, what a beautiful parade of birds. I’ve seen just a few American Redstarts mostly due to their song alerting me to a new bird in the garden. Only one pair of Painted Buntings in 10 years. Would love to change that. Maybe I should look out front more where most of the feather grass is. No birds, but some other fun sightings this past month. Interesting about the redstarts and their song. I’m not sure I’ve ever heard them sing; I guess mine are the quiet ones. 🙂 I was surprise and pleased about the male Painted noshing on the feathergrass. He spent quite a bit of time eating and returned several times. I enjoy your posts very much, Tina – they are always so informative and your yard seems lovely. Thanks for sharing it with us. The spring migration procession you experienced is fantastic! Do you have a post showing more of your pond to which you could point me? I’m curious about the size, and how you may have made special areas for birds. I’m considering installing one and would like to make it as inviting as possible. Your American Redstart looked odd to me with the black on the face, and after looking it up (in Sibley), I think it may be a first year male. I didn’t realize it took a full year for them to molt into full adult plumage. Cool! I haven’t focused on the pond specifically in too many posts, not sure why because it’s the feature which is a focal point of the garden. 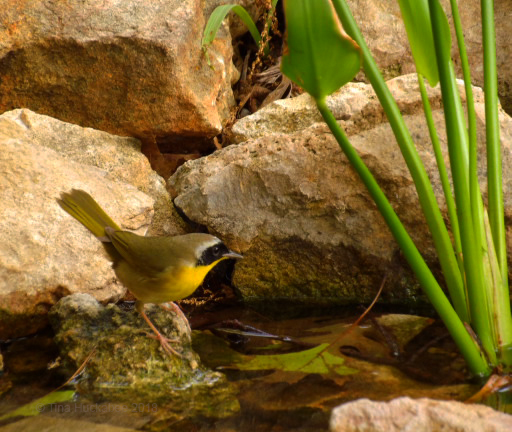 Our pond is 1200 gallons, with a waterfall (you really want that–birds love it! ), and a bog–which you also want, again, birds love it. Bogs serve as filters. Just to define some terms, biological filters= plants in waterfalls and bogs and mechanical filters= filter medium placed in the intake. You don’t have to have filters, but you’ll replace your pump more often. My one regret is that we didn’t incorporate a “beach” sort of area, although that certainly would have made it easier for the herons to fish! Except for that one long day of cleaning it out (we do it in late February or in March), the pond has proved to be low maintenance. Good luck with yours; I’d be interested in seeing photos of your progress. Thank you-it’s great to see more of your pond. It must be so rewarding to see that every day and experience all it brings to your landscape. You really have a variety of visitors. 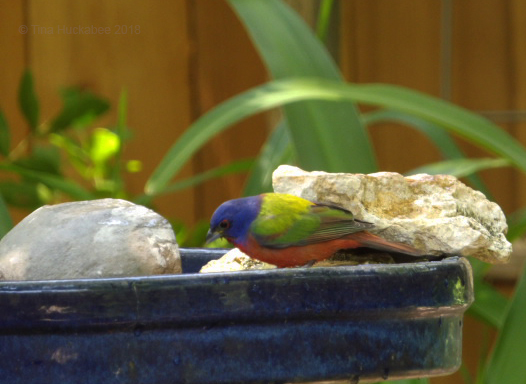 I would love to see a painted bunting. Thanks! It’s really a thrill to see something that colorful, especially since we also host so many drab House sparrows! What a treat to see these lovely birds. Your photos are great. The Painted Buntings I would enjoy seeing. My husband and I saw male and female tanagers when we first moved here 17 years ago but not since. Thanks! It’s a treat to see tanagers, as they’re so beautiful. I hope you’ll see them again soon! Yes, it definitely rocks a tropical look! So many fantastic birds! 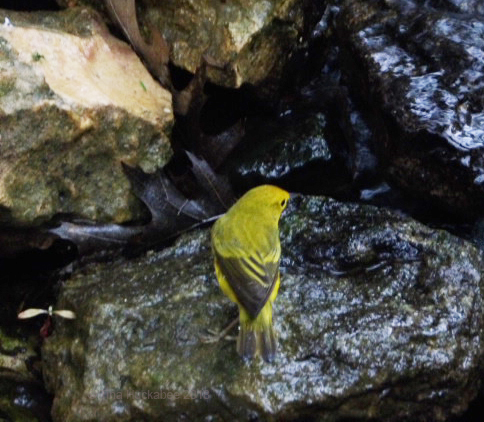 I love the Redstart, Yellow Warbler, and Yellowthroat – we’ve seen those, but very rarely. 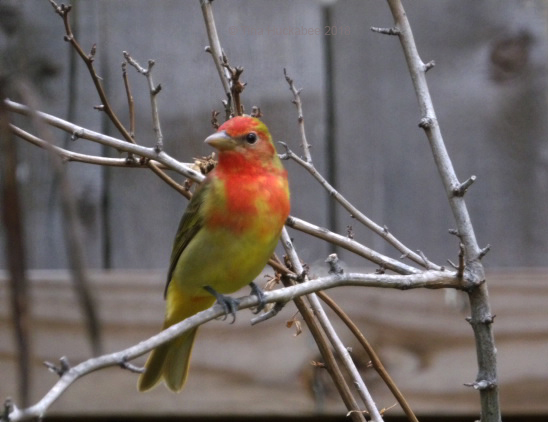 I REALLY love the Painted Bunting and Summer Tanager – never seen those before. Thanks, Jason! The tanagers and buntings are stunners. They’re still around here in Central Texas, but not in my garden. Sniff. Wow, some colorful birds pass through your areas. Texas is a major flyway of North American birds and we’re fortunate to see a wide variety of migratory birds in spring and autumn. Hi Tina, your pond seems to be the place to be in summer! How wonderful to be able to watch the comings and goings at that busy hangout. And I just love those painted buntings, so aptly named too. Yes, everyone is fond of the pond. For now, it’s mostly our resident birds and the toads. I guess I’d better get some photos of the toads sometime this summer! There are a lot of interesting birds passing through your garden, we have bee eaters here, but different to yours. My husband is a very keen bird watcher, he’s out now helping to protect ground nesting Montague harriers. Yes, I’m so fortunate to enjoy these birds. Nice that your husband is helping to restore/protect habitat–birders are wonderful people! Do you get the Africa-to-Europe migrations where you live? Yes we do. In April we visited Ventotene a tiny island off the coast between Naples and Rome. The birds are exhausted when they arrive as it is often the first landfall after Africa. They stop to feed and recover. We saw about 60 species in three and a half days. Wow, that’s impressive! We have the same here–exhausted little birds as they’ve flown across the Gulf of Mexico. Boaters in the Gulf will often post photos of the birds resting on the boats. Most of the boaters will provide water and sometime, a little sugar water.